We didn’t send out holiday cards last year and I missed it. So I’m trying to think early about what to send this year. I really like the idea of using a house portrait for a card. 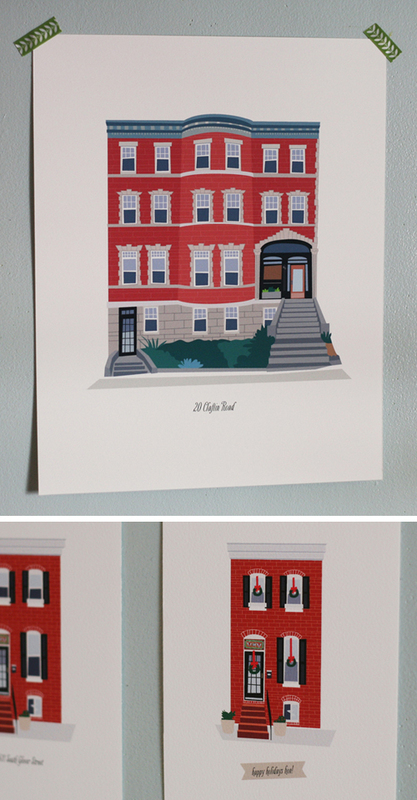 Send Miranda a photo of your house, and she’ll draw up a charming little exterior just for you. I love the version with wreaths on the windows! La Cressonnière doesn’t belong to us forever, but it feels like home right now and I think it would be neat to have a little drawing made of it. Do you like how your house looks? Do you think it would make a pretty card? Have you already made plans for your holiday cards this year? This is adorable, and would make a great gift, too! We have friends who have a second home near Lake George, and the house has been in the family for a few generations. They would love something like this. This is a neat idea. I am thinking a little drawing as a gift idea would be really thoughtful, as well. Thank you. The illustrations are gorgeous! I like to have my home illustration but to frame it. I wonder if she could illustrate my house that has a very modern style. You should absolutely having a drawing of La Cressonnière! If all goes well we will home owners in the next month! (Fingers crossed!) my mom paints house portraits on stones. I can’t wait to display on at our front door!! Makes a great going-away gift too! When we moved from New York, a neighbor gave us a framed watercolor the home we lived in for five years. We cherish it! What a beautiful idea! I haven’t even begun to think about holiday cards yet. Many years ago my parents had a drawing made of our family home. One of my sisters has had the original for some time, but when our mother died a year and a half ago, none of my siblings wanted the copy that Mom had kept, so I was able to bring it into my home. I have so many special memories associated with that house, so I’m very grateful that my parents had it made and that I can now enjoy it! I really love this idea! We are embarking on the journey of finding a larger home this spring to fit our growing family needs and having had two home births in our first home together this would be such a lovely sentiment. Thanks for sharing. Last year marked 10 years for us in our beloved house. We moved in with one baby and now have four. So, we did a custom house portrait card in honor of all the memories we have made in our house. I created the house portrait in illustrator (complete with Christmas lights) and then put a cut out of our family portrait standing in front of it. I loved it. I haven’t thought at all about a card for this year, though, and it’s almost November. Yikes! I LOVE this idea. Such beautiful work too. I might have to look into a print. Another really cute house portrait style can be found at Cute House Portraits dot Com!